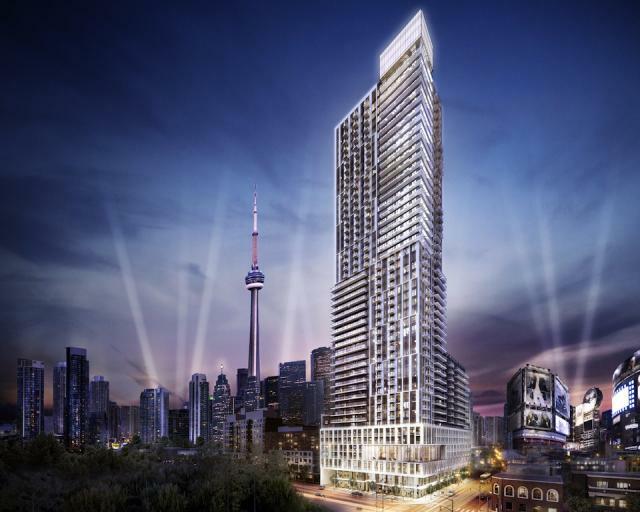 Dundas Square Gardens condos will bring affordable luxury living to one of downtown Toronto’s most exciting emerging neighbourhoods. Dundas Square Gardens is a pre-construction development by the Easton’s Group, and will feature architectural design by Page+Steele Architects. Dundas Square Gardens will be located at 200 Dundas St E, at the corner of Dundas and Jarvis. This project will feature a 47 storey tower on the site’s western half, and a unique 16 storey Garden Tower featuring five rooftop gardens and terraces. There will be a total of 978 units. Unit pricing starts at $199,900, with two bedroom suites starting at $299,900. Suites will range in size from 335 sq ft to 747 sq ft. Features and finishes include quartz kitchen counters, stainless steel appliances, and 8.5′ ceilings. Many of the units in the Garden Tower will have large terraces. Amenities will include 24 hr concierge, visitor parking, guest suite, gym, theatre room, party room, roof-top deck, sauna, and swimming pool. Dundas Square Gardens is currently selling units to VIP condo realtors (such as myself), and not open to the general public.